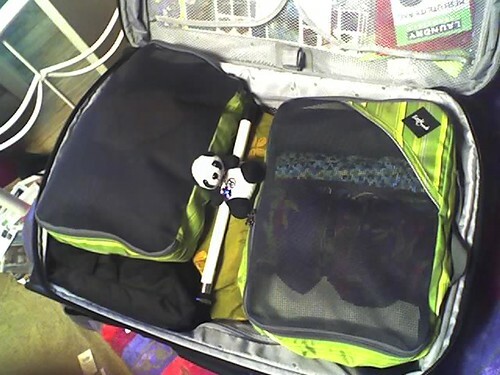 I can hardly believe all these clothes, 4 pair of shoes, my book for the panda base, a long rain coat, gloves and hat…a heavy hoodie, an extra white cane (in case I lose or damage mine) my toiletries, and other misc stuff fit into this 24″ suitcase. Thank goodness for these Eagle Creek packing cubes!! Wish I could pack that well for the move. Heehee.. Looks like you will be prepared for everything that comes your way. LOL..yeah I hear ya on that move thing Billie!! All I had to do is pack the equivilant of one moving “box”. You have a whole house load to shuffle around. I will say I do adore moving. I guess I must be a gypsy at heart. I love the process of getting rid of things and getting my life organized again plus all the happy surprises of things I forgot I had. Now with that said…after 10 years of bead accumulation (longest time I have EVER lived in one place) it may not be quite as much fun. Especially with a very established garden that I adore. Thanks for stopping by Billie! !